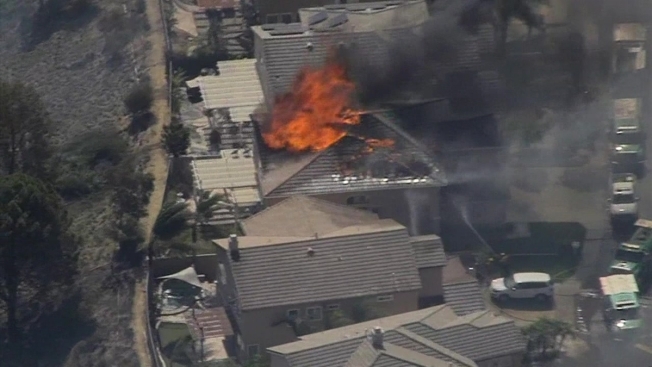 "I know people who have lost everything, a whole life of memories"
Worried residents in Orange County were forced to watch as a wind-driven fire raced toward their houses Monday, some returning to their neighborhoods only to find that the flames had already consumed their homes. The fire, dubbed the Canyon Fire 2, originated in Anaheim Hills and quickly tore through the hillsides, threatening nearby homes and setting some alight as it grew to 6,000 acres by the evening. By 9 p.m., 24 structures were destroyed as a thousand firefighters battled the blaze to 5 percent containment. "The hillside was on fire," said John Tague. "I've lived up here 21 years and I've never seen it like this, ever." Tague said his wife and kids were at home when he heard about the fire and told them to "get out instantly." He was forced to park three miles from his home, returning to find his neighbors' houses up in flames. "It came up so quick," Tague said. "There was nothing you could do." Kevin Shaevitz was one of the unfortunate residents whose home did not survive. "It's pretty surreal," said Shaevitz, who raced home with his wife upon learning of the fire. Their four children were safe at school at the time, but the couple wanted to try to salvage what they could. As Shaevitz saw the flames reach his neighbor's backyard, he knew he had to go. Fortunately, Shaevitz and his wife were ready, grabbing important documents and photos before taking off. Crestfallen but relieved no one was hurt, Shaevitz said he will "probably try and handle this the best I can for now and then deal with it emotionally a couple months down the road." Tague sympathized with residents like Shaevitz, who lost more than just a house to the fire. "I know people who have lost everything, a whole life of memories," Tague said. "Not just their homes, but everything they've accumulated over the last 30 years. It's just sad."